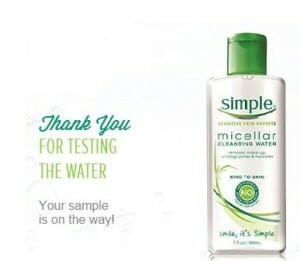 Free Simple Micellar Cleansing Water!! Go HERE to get a FREE sample of Simple Micellar Cleansing Water! Simple Micellar Cleansing Water removes makeup, cleanses and hydrates. It’s always fun to try new beauty products before you buy them! I guarantee this one won’t last long so pickup yours while you can!